At Environics, we’re committed to giving back to our community. We are proud to live and work in the vibrant DMV area, and honored to support the organizations committed to improving the lives of its residents. One such organization is Inner City-Inner Child (ICIC), a DC-area nonprofit that provides disadvantaged children with early arts-integrated learning experiences, guiding them to explore books through song, dance, African Drumming, and the visual arts. ICIC works holistically with parents, teachers, and students themselves to set a path to literacy and future success. For example, ICIC’s Dancing with Books program brings local teaching artists in DCPS classrooms. The artists spend six weeks with children and teachers, teaching songs and dances that work with a chosen book, teaching children to tell a story with their whole bodies. This teaches students critical skills such as literacy, math, and collaboration. The program educates students and teachers in tandem — as the students are learning to “dance the book” through movement and song, teaching artists work directly with classroom teachers to develop techniques to carry this learning forward beyond the end of the residency. The program culminates in a final performance, where children and teachers perform the books for parents. ICIC also offers professional development opportunities to early childhood educators through their Naptime U program. In these sessions, teachers learn how to integrate the arts into their classrooms. These workshops give teachers insights into the long-term benefits of arts-integrated education, as well as providing an opportunity earn required credit hours from the Office of the State Superintendent of Education. As part of our work to support ICIC’s mission, this year we created and executed the “Fill the Shelf” campaign to raise funds on Giving Tuesday. 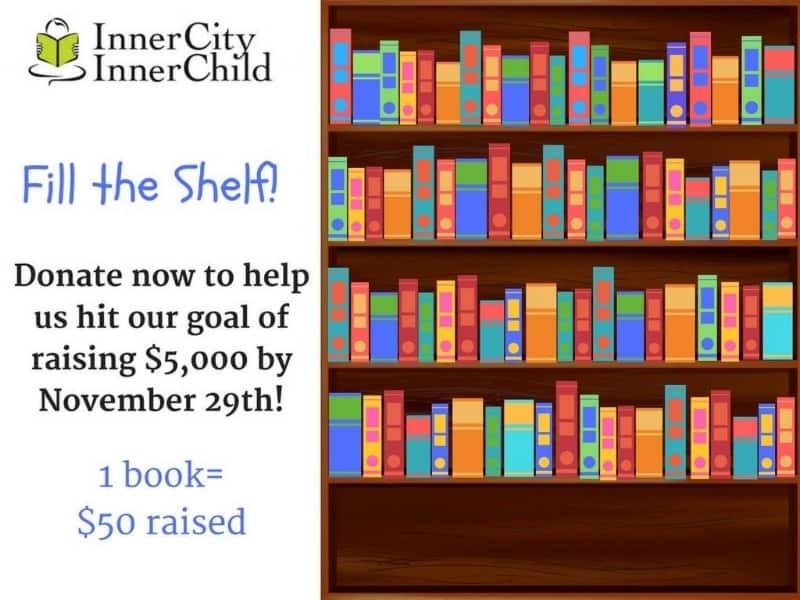 For this two-week campaign, we represented donations as books on a shelf, with the end goal of filling all the shelves when they reached their goal of $5,000. We continuously updated the graphic as donations came in, giving readers on social media and via email a clear visual representation of the campaign’s progress and how close they were to reaching their goals. We are pleased to report that this approach was tremendously successful. ICIC met and exceeded their goal of $5,000, which is enough to fill 10 preschool classrooms with books. We also worked with ICIC to ensure that communications throughout the campaign to their target donors were strong and focused. We recommended that they include their fundraising goal of $5,000 in every update they sent out. This way everyone could see how close they were to reaching their goal, thus encouraging them to make a donation themselves. Additionally, we advised them on the importance of showing the impact of donated funds on the children they serve – -their case for support. People are much more likely to donate when they know exactly where their money is going and who it is helping, rather than giving blanket donations to an organization as a whole. Including language that clearly stated how many books a donation could buy for a classroom helped assure potential donors that their contribution will have a direct impact on children in their community. We were proud to support ICIC’s Giving Tuesday campaign and look forward to continuing to work with them in the new year. Learn more about our work in service of associations and nonprofits here.